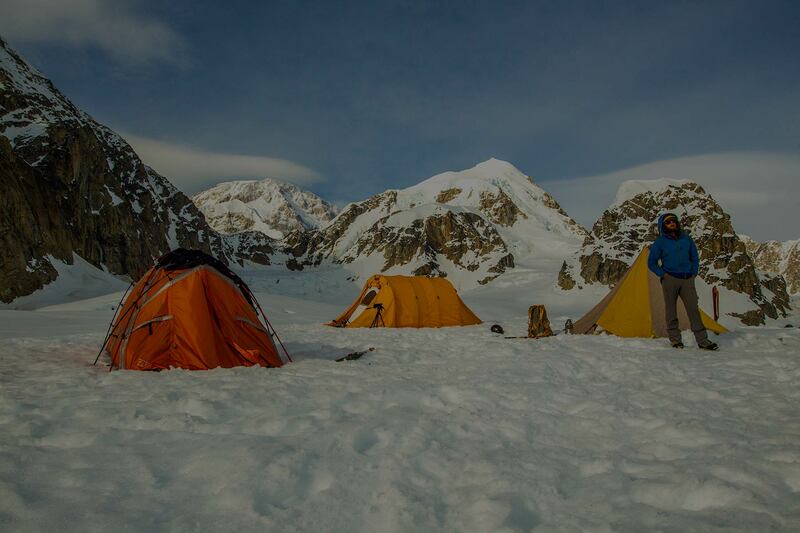 Home for climbing Denali, Foraker, Hunter, and more. Fly with the most experienced air taxi with the best safety record and price! 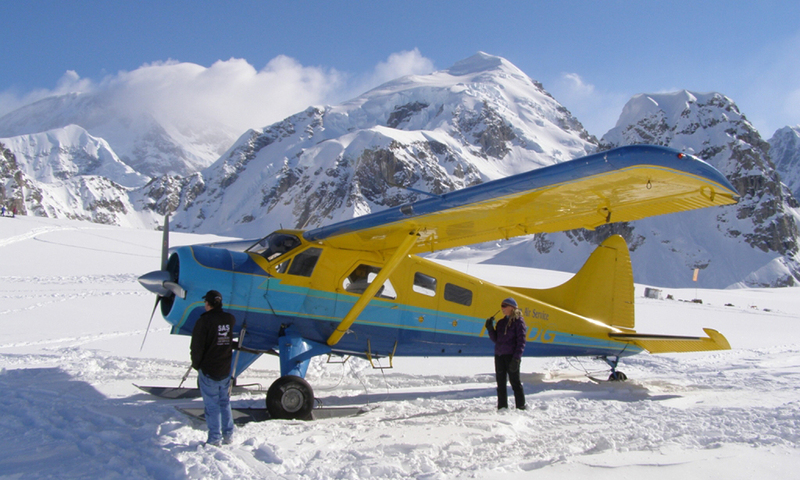 Sheldon Air Service is built on family values, and we've been raised catering to climbers. Every climber is our priority. We do our best to help you with your itinerary including lodging, meals and transportation. 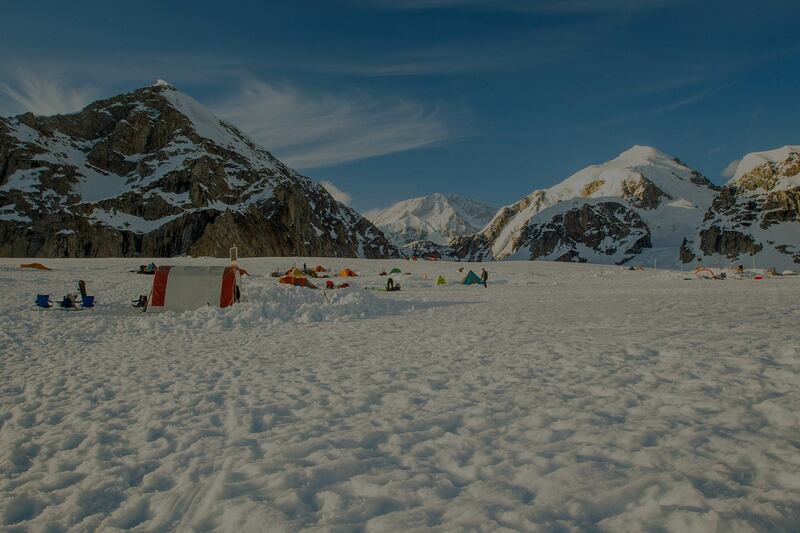 We are proud to announce that Sheldon Air Service is operating our own independent base camp on the Kahiltna Glacier, to keep your costs down as well as cater to our climber's needs more personally. Base Camp on the southeast fork of the Kahiltna Glacier is primarily where we fly climbers to climb the West Buttress, West Rib, South Buttress, and Cassin Ridge along with Mt. Foraker, Mt. Hunter, Mt. Frances, Mt. Crosson and Kahiltna Dome. 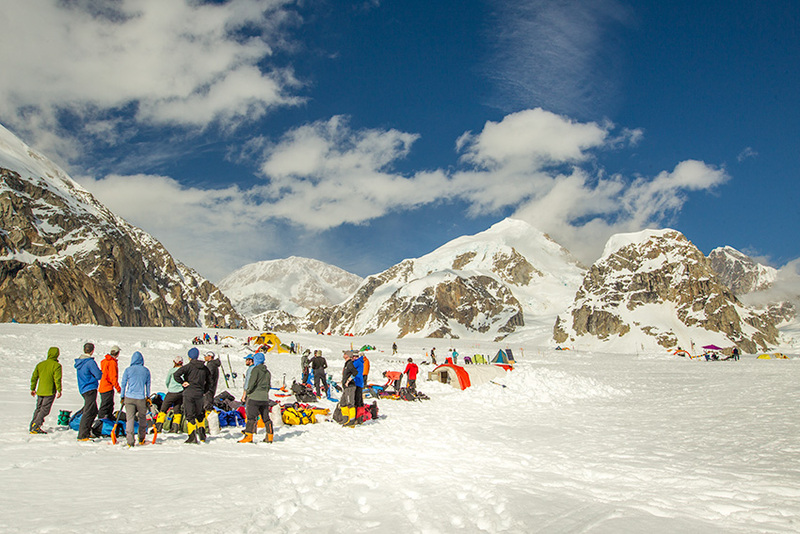 During the climbing season there can be as many as 100 people at the Base Camp waiting to climb or fly out. It's quite a sight to view dozens of colorful tents all set up and occupied by people from around the World. The glacier landing area is about 2 miles long and 1/4 mile wide. There are several areas where crevasses open up into an abyss potentially thousands of feet deep. A 3 degree down-slope is essential for take-off downhill. Snow, rock and icewalls tower 7000ft high and 1200ft wide from the landing area. More than once an avalanche has covered the landing area. The Kahiltna Glacier is 7200 ft above sea level and is a 36-mile-long glacier of the Alaska Range. It starts on the southwest slope of Denali (Mount McKinley) near Kahiltna Pass - elevation 10,320 ft. Its main channel runs almost due south between Mount Foraker to the west and Mount Hunter to the east. The West Buttress (63.06920° N / 151.0036° W ) is the standard route climbers take to summit Denali, and it provides access to the popular, but more technical, West Rib and Cassin Ridge routes. The most popular camps along the West Buttress are located at 7,200 ft (Base Camp); 7,800 ft; 9,500 ft; 11,000 ft; 14,200 ft; and 17,200 ft. Other camps located at 12,500 ft and 16,000 ft, should only be used under ideal weather conditions as the 12,500 ft camp is vulnerable to avalanches and the 16,000 ft camp is very exposed to high winds. The 11,000 ft camp also experiences avalanches and serac fall, and care should be taken to avoid these two hazards when setting up camp. Above 14,200 ft, snow caves or igloos are usually constructed as a back up shelter in case bad weather moves in. Total horizontal length of the West Buttress route is approximately 13 miles with about 13,500 ft of vertical gain. Between base camp and 11,000 ft, the route is relatively flat and the main hazards are crevasse falls. Above 11,000 ft, the route steepens to moderate slopes (35-45 degrees) alternating with flat benches and bowls. Equipment and supplies are typically carried by sled to 11,000 ft. 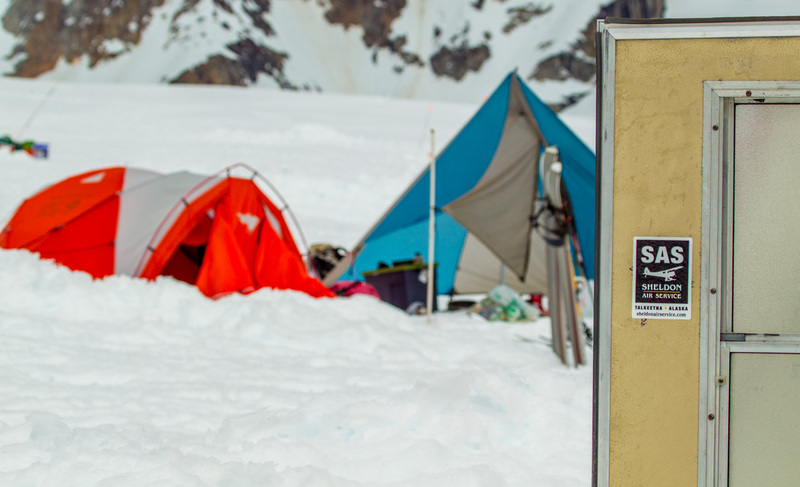 Above 11,000 ft, gear and food are usually ferried between camps in two trips. West Buttress expeditions average around 21 days. 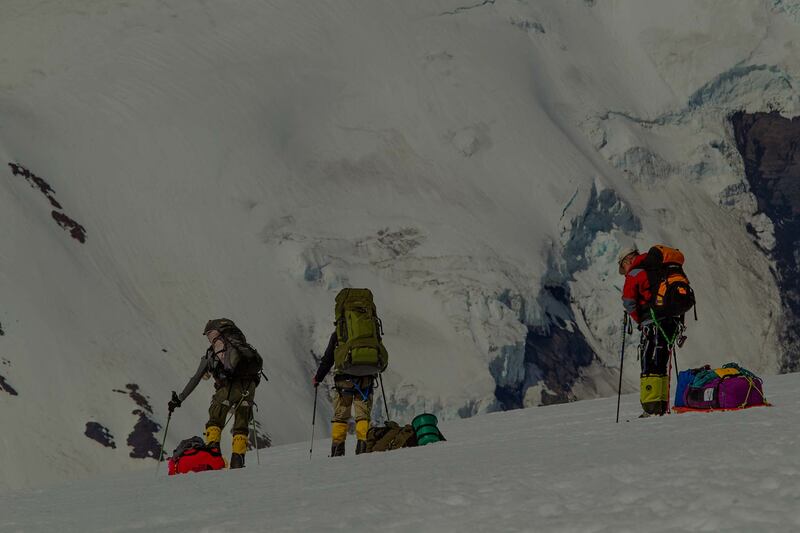 A 2-3 day supply of food and fuel should be left at base camp in case weather prevents planes from landing on the glacier (climbers have been stranded for as long as 2 weeks due to inclement weather). The following is a sample West Buttress itinerary during good weather. Denali, formerly Mount McKinley, is located in the sub-polar low, a region where arctic air moving from the north converges with warmer air moving from the south at a latitude of 60 degrees (Denali is located at 63 degrees). This convergence creates a belt of unstable weather at this latitude. Associated with the sub-polar low is a semi-permanent area of low pressure known as the Aleutian Low, located in the vicinity of the Aleutian Islands. Weather systems generated or passing through the Aleutian Low often take a straight path for the Alaska Ranges and hit Denali with little warning. Denali also has a reputation for streaky weather with long periods of either continuous bad weather or long periods of good weather. This explains why inexperienced climbers may reach the summit while veteran climbers don't make it back from their climb. Denali undergoes long periods of clear skies and high winds, and these conditions are most often seen throughout the climbing season (April through June). Windstorms often come with little if any warning and are thus amongst the most feared weather patterns on the mountain. The first signs of increasing high winds are the appearance of lenticular cloud caps over the summit. These are the cyclonic weather systems that sweep in from the southwest and vary in intensity, the strongest of which have been described as snow shedding hurricanes. During the more powerful storms, it is generally impossible to be above 14,000 feet. This occurs when warm, moist air migrates inland from the Pacific Ocean and creates a period of steady drizzle in the lowlands. During these periods, the top of the cloud layer occurs between 10,000 and 14,000 feet and conditions above these altitudes may be quite good. At other times, skies above 14,000 feet will be clear, but windy. Conditions on the lower mountain, however, tend to get sloppy and may even experience periods of rainfall and whiteout.